DUCTZ is a member of Service Brands International (SBI), a group of service companies that provides a variety of timesaving services for the busy consumer. SBI has over twenty years of experience in helping entrepreneurs achieve the dream of owning their own business. • Residential Homes & New Construction Duct Cleaning: The construction process creates a lot of dust and debris. You'll work with local builders to ensure that new homes do not come with built-in problems. • Dryer Vent Cleaning: No matter what the structure -- single-family home, condo, apartment building, hotel or Laundromat - vent cleaning services can help your customers lower fire risk and improve overall dryer performance. • Commercial Duct Services: Clean ducts can help your customers improve air delivery systems and ensure an adequate supply of clean, fresh air. With healthier air, employees often experience fewer symptoms of illness and respiratory problems. 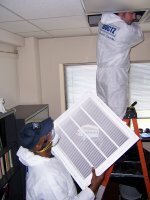 • Restoration: After fire or water damage, repairs are not complete unless they include air duct restoration. Air duct cleaning ensures that all harmful residue left after a fire is properly removed before the building is reoccupied. Your success as a Ductz franchise owner is in properly managing your business -- not cleaning ducts. Your business is building relationships in the business community and dispatching your trained technicians to do the work. We will teach you how to effectively recruit, train, and motivate good employees. The technicians do the work, you manage the business! We’ll also teach you the business to business marketing skills that will help you build a profitable base of referral partners. If you qualify and are invited to our Discovery Day, you will get a glimpse of the support we provide to help you build a well-managed business. Our winning combination of people, technology, and proven business systems will help you maximize and reach your professional potential. To help our franchise owners succeed in business and in life. Many companies have a purpose statement, but not all live by them. At the DUCTZ home office, we do. Everyone in our company knows this statement of purpose. It gives focus to our work, and is the measuring stick for all our activities. DUCTZ has just completed phase II of its franchise expansion plan. In this phase, we selected five concept development locations throughout the United States, and focused on refining our business model in both residential and commercial markets. We are now entering phase III, which allows for additional expansion throughout the United States. This is your opportunity to get in on the ground floor of this emerging industry.